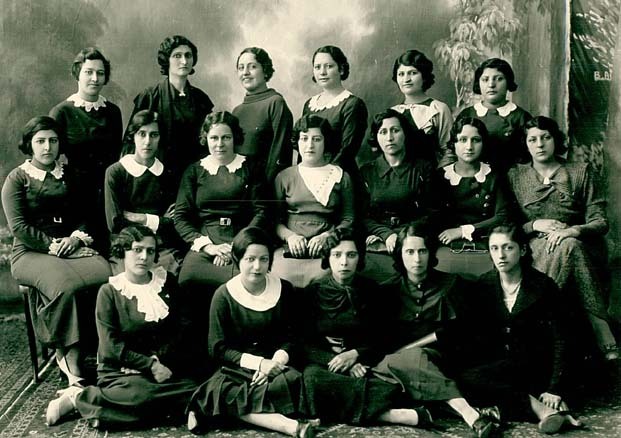 These are the first members of Kanoon Banovaan Iran (Iranian Women's Association). Unfortunately I do not know all their names. It is probable that among your readers there are persons who may know. Standing (right to left): The first one is, Nosrat Hakimi, the forth one is Ashraf Nabavi, the last is Akhtare Kia. Sitting (right to left): The one in the middle is Hajar Tarbiat (the head of the Kanoon).